This one was kinda fun to do. I imagine meeting Lo'meath (and hence Romeo) like this on the street would be kinda like bumping into an underground poet who just keeps speaking in prose. Wouldn't want to deal with it myself if I was busy. Also, a little backstory for those who don't know. A person's race doesn't determine their allegiance to each faction, though the core of each is Draenei and Blood Elf respectively. 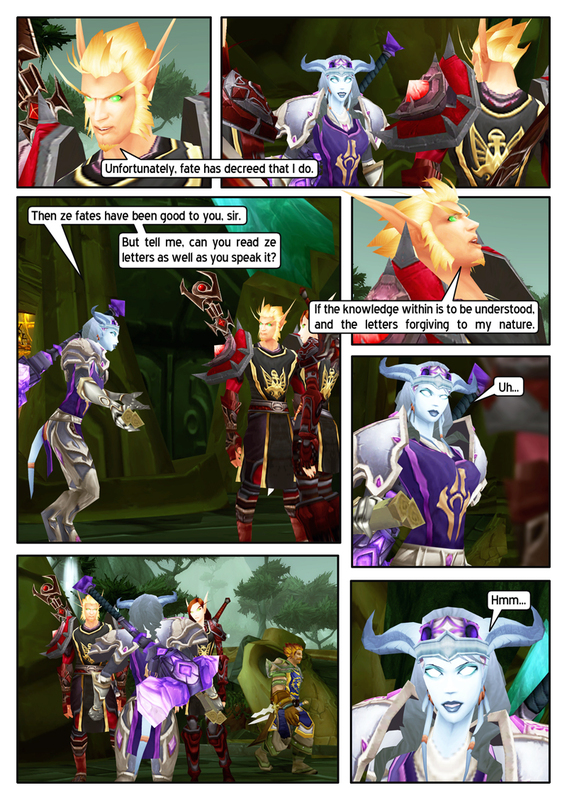 It's possible the guard doesn't care, or thinks Lo'meath and Belianna could be Horde Blood Elves, instead of Scryers. I am really enjoying this! I especially loved how you livened up the tour in Shat - beautiful work! Would you mind if I put a link to you on "Tokkar & Jekk" and "Kindred Spirits"? Thoroughly enjoying the storyline, and the artwork definitely sets the appropriate mood. I just followed the link of WowInsider. This is some excellent work. Everything looks so clean and sharp! It's a work of art, for sure. Bravo!